Make the tile in your house sparkle with this homemade recipe! Pour the baking soda into a 12 oz. jar. Add in the castile soap and mix. Add in white vinegar and mix. It will bubble a tiny bit. Add in all the essential oils and mix well. Cover with lid. Use a small dab of the scrub on a sponge and clean the grout. 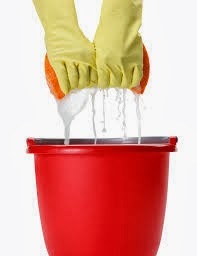 Depending on the sensitivity of your skin, you may want to wear cleaning gloves.